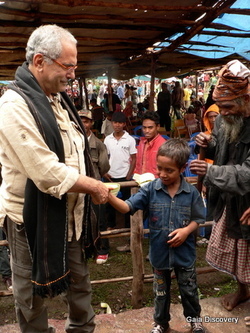 Mallika Naguran finds out what drives Dr Jose Ramos-Horta, 1996 Nobel Peace Prize laureate and current President of Timor Leste, in guiding a war-torn country out of its ghastly past towards a brighter and peaceful future. An exclusive interview with Gaia Discovery. Dr Jose Ramos-Horta at Presidential Palace. Singapore, 26 January 2009. Timor Leste – the world’s youngest independent country - had a difficult childbirth. Ten years after the country had claimed its right to govern its own territory (first from the Portuguese and then from the Indonesians), President Jose Ramos-Horta knows there is still a lot of work to do. Pain and suffering aside from bloody wars with political rivals, the rebuilding effort is nail-bitingly long, arduous but constructive. For the interview, I was invited to the President's own residence in Dili, the capital city of Timor Leste, on 27 December 2009. We sat in his rather breezy living room decorated with paintings and memorabilia, and an old-fashioned gramophone. With cockerels crowing in the background and deers rummaging through wild shrubs in the side porch, the President shared with me his vision for lifting the country from the dungeons of poverty and hopelessness. It is only now trying to catch up with what developed countries take for granted – bumpy, crumbling roads that won’t twist your neck in a 4-wheel drive, schools for basic education and technical skills, better (dust-free) food and nutrition, stable and clean renewable energy sources for electricity and power, clean drinking water… I can stay up all night and the list can go on. The 2009 UN Human Development Report reveals that 77.5% of Timorese earn $2 a day. The expenditure per capita on health is $150 or 16.4% of total public expenditure. Aid to social sectors is high at 72.2%; Papua New Guinea, in comparison, allocates 59% of its public expenditure on improving the social framework. The irony is, Timor Leste isn’t that poor if you look what’s beneath the surface. It is rich in oil and gas resources, largely untapped. The Bayu Undan gas field alone has been predicted to reap $US12-15 billion by 2023. A few other scattered oil and gas fields will gladly gush generous income in buckets – and trillions of them. There are sizeable deposits of gold, silver, copper and marble too. “More than 20 types of minerals have been found here. We have some of the world’s best marbles. But I am not keen to promote extraction,” revealed Dr Horta, the country's second President since 20 May 2007. What he is keen on is low carbon, sustainable development to ensure that Timor Leste retains its natural reserves for the future. And charm. In 2008, the tiny country with 1.1 million people recorded an 11% GDP growth. And it is set to grow with commercial investments from immediate neighbours like Indonesia, Australia, China and Malaysia, as well as farther trading partners such as the UK, Spain and Italy. Returning to Dili in 1999 after 24 years of exile to help rebuild his broken country, President Ramos surprised his peers on his environmental stand. “I talked about preserving the land, preserving the forest and preserving the water. My colleagues in the government gave me a puzzled look, thinking what does this Foreign Minister know about the environment?” he chuckled. Dr Jose Ramos-Horta has since initiated several programs such as cleaning up beaches and rivers, and tree planting. Each kid in school and church has to plant 10 trees a year. As firewood provides poor Timorese with warmth and energy for cooking, the Government intends to supplement the green resources with intensive tree planting. Greater wealth for all without sacrificing the earth. This is a short-term measure until biostove, a less smoky option, can be made fully accessible. In addition, there exist small scale but impressive solar and biogas applications in remote areas (more on this soon on Gaia Discovery). For city dwellers and industry use, the oil and gas fields will be exploited further to ensure a consistent and uninterrupted supply of energy. The President frowns, literally, on garbage. On 23 December 2009, the Government launched a drive-only-if-you-have-to and clean up campaign. The military, police, civil servants and some businesses spent the day off the roads, and picking up rubbish instead. Mountains of garbage, hundreds of tons, were loaded up on trucks. But these end up at a landfill. “We don’t have an incinerator like Singapore does,” said the President, acknowledging that the city’s waste management can be improved. Dr Horta shared that a Singapore town planner has pitched a proposal to the Prime Minister Xanana Gusmao to transform Timor Leste into a sustainable country. The masterplan, which according to the President costs $20 million, involves assessment of the natural landscape, waterways and cityscapes to exploit the country’s resources wisely while developing it into a liveable city. “So in 20 years, we will have a completely different country that is healthy, prosperous,” he said. Kids are special guests at the President's birthday do. According to a 2006 United Nations Development Programme Human Development Report, 80 out of 1000 Timorese children die before the age of five years. The 2009 UN Human Poverty Index reports that 46% of children in Timor Leste under the age of five are underweight. “This figure has improved, due to the increased medical facilities and doctors we have,” said the President, adding that 200 doctors in Timor Leste are from Cuba alone. A number of Timorese are also sponsored to study medicine abroad to address the nation’s health issue. Dr Horta has started a programme to help kids stay off the streets, especially the underprivileged and disabled. So far, around 500 kids are supported. Some of them turned up at his birthday party, even on wheelchairs, tucking into some honest-to-goodness spreads. The newly built Presidential Palace (a gift from China) incorporates President Ramos’ desire to host children, not just distinguished guests. The front gates are open, though guarded, and children can enter freely, squeal with delight at the playground and splash about in the swimming pool (the only Presidential Palace in the world to have a pool for kids, I am told). Kids can also surf for information using Wi-Fi on the ground for free. And they are protected from violence. “I said no machine guns in the building. I hate guns,” said President Ramos. Education for a better environment - Dr Horta. Passing by the Presidential Palace one afternoon, the huge front façade was void of children, and truth is, it will be a while before computers can be made affordable and accessible, even to adults. Most Timorese, especially mountaineers and villagers, will find a complete meal a luxury. The country is bolstered by foreign aid and NGO services; however, poverty is still evident. Timorese over 60 years of age get a monthly pension of USD20 that helps them purchase necessities such as kerosene, rice and sugar. On 27 December 2009, the President announced at the Letefoho primary school opening ceremony, up on the mountains some 6,000 feet high, that this amount would be increased to USD30 monthly. “With the income generated from oil and gas, this is just one way how it can benefit the people,” he said. Only time will tell how else Timor Leste will change for the better. If President Horta can press on the sustainability agenda while the country surges ahead with economic growth and social development, Timor Leste is probably headed in the right direction. The Editor thanks Austasia Airlines and Hotel California for their gracious sponsorships in enabling this interview. Air Timor takes you from Singapore to Dili, and back, thrice a week (Tues, Thurs & Sat). Flight time around three and half hours. Newer PostHitesh Mehta on Ecolodge Principles and His New Book "Authentic Ecolodges"